One of my favorite things to do for fun is host dinner parties. Most of my friends are fully aware that I have worked in a lot of restaurants and bars throughout my career so when they come to my house they expect an outrageously delicious meal and most likely a delicious cocktail or two. 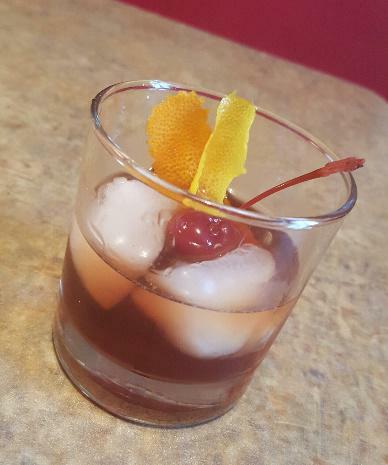 My absolute favorite cocktail to make is the Old Fashioned. 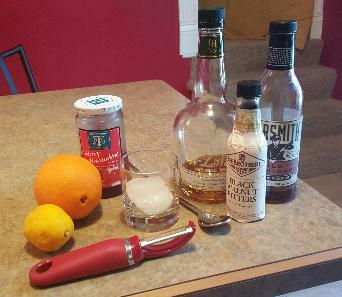 This is the quintessential whiskey cocktail and some would argue it was the first cocktail ever invented; hence the name, Old Fashioned. The Old Fashioned is a simple cocktail but a few minor tweaks to your home bar game can blow your guests’ minds and I would love to show you how to do just that! 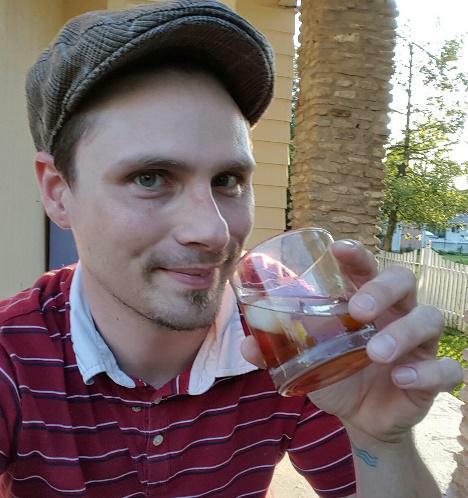 Classically, the Old Fashioned is a whiskey drink made with syrup, bitters and fruit. The original recipe called for muddled fruit but I like to take a more modern and subtle approach to my Old Fashioned by using the peel of a couple citrus fruits. You’re ingredients will be either a bourbon or rye whiskey, bitters, syrup, maraschino cherries, an orange and a lemon. Then add an ounce of syrup. Some bartenders will make a syrup in the glass by adding a sugar cube and water but I found this great product in the liquor section of my local grocery called Barsmith. My pro friends are cringing right now as they read this because it is soooo NOT a pure ingredient. It’s processed and even contains food coloring but I saw it in the store, picked up a bottle to try and fell in love with it. Very well balanced sweetness and I actually like the color it adds to the cocktail. Throw in a couple dashes of bitters. My favorite to use is the Black Walnut Bitters by Free Brothers. 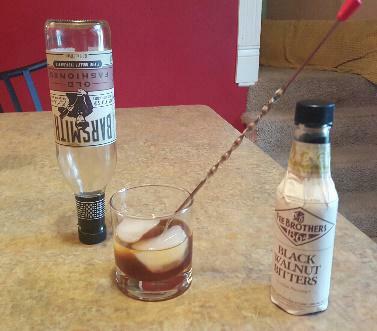 This is a game changer for my Old Fashioned. Not exactly a secret ingredient since I’m sharing it now but it’s definitely the reason everyone I’ve served this drink to has asked for a second and usually a third. All you have to do next is stir the liquid until the ice starts to melt. 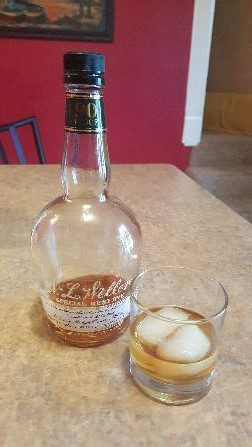 The water from the ice is what takes the alcohol sting out and really opens up the aromas and flavors. I usually stir mine for about twenty seconds. Next, add a cherry and peel off a wide strip of lemon and orange peel. Crucial step here is to twist the peel over the top of the glass and gently wipe the rim with both of these peels. This adds such an amazing touch in showmanship for your guests who are watching you create their masterpiece and, more importantly, brings the fresh scent of citrus to their nose as soon as they bring the glass up for the first sip. So after you drop these peels in, push the glass towards your friend and take a bow… Or take your glass out to the porch and enjoy it yourself. The simple at home Old Fashioned! Richard Darshwood is the host of Magic Dinner Bourbon, Kentucky's ONLY dinner experience that includes magic AND bourbon. He is one of the very few magicians that make everyone a participant in some way. Your guests make the magic happen. He has performed at Planet Hollywood in Las Vegas, personally entertained prominent stars such as Martin Scorses, Jerry Bruckheimer, and Miranda Lambert. He will make your guests feel like celebrities as well! Richard shares his bourbon experiences at Magic Dinner Bourbon, as well as leaving everyone spellbound with his intimate brand of magic.